The dual-screen tablet is currently being developed by the Yota Devices Company, the producer of the YotaPhone2 smartphone. The Russian Yota Devices Company, which recently released the YotaPhone2 smartphone, is working on a new tablet. 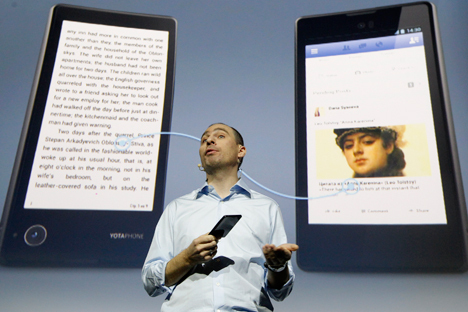 Just like the smartphone, the tablet will have a dual screen. One of them will be standard, while the other will be based on electronic ink technology, says Yota Device President Vladislav Martynov. In his words, the company is currently focusing on its main product, the YotaPhone2. The tablet is in the process of development, but no final decisions have yet been made about its release. Dmitri Gorilovsky, an inventor of the YotaPhone, is convinced that if Yota Devices produces the tablet, it will have to be big, with a screen size of nine or 10 inches. This means that it will not be a low-cost product. "Without the second screen the cost can be approximately $300-450, but the display with electronic ink will add a cost of about $150," Gorilovsky assumes. Martynov is convinced that even if the cost of the tablet runs high, price is not the most important element for such a device. "With the appearance of a new device on the market the most important thing about it will be its unique advantages for the users, the things that makes work with the tablet comfortable and useful," explains Martynov. "These are advantages that users are willing to pay for." Martynov said that the development process of a device begins from a concept. The company's specialists propose various ideas, which are then transferred to a department that analyzes a product’s commercial efficiency and potential. "Currently, the project of creating the tablet is in the phase of business efficiency analysis," says Martynov. "Specialists analyze user preferences: what the demand for the device will be among various categories of users, such as high school and university students, government officials, businessmen and others." According to Martynov, one of YotaPhone's principal advantages is the electronic ink screen's low energy consumption. "The lifetime of a tablet battery is not a problem,” Martynov says. “There are many devices on the market that work for a long time on one charge. That is not considered an advantage. The tablet needs a new feature that will attract users." Another unique aspect of electronic ink is that the image on the screen can be clearly seen even in the bright sun. The company's developers think that if users buy a more expensive device, it should contain something special. What’s next after YotaPhone 2? Yota Devices believes that it can develop a unique "scenario" for using the dual-screen tablet. However, in the opinion of Yevgeny Kozlov, owner of Russia's largest mobile telephone museum, Yota Devices will have a hard time working on the smartphone market alone. YotaPhone's second display is usually used for reading and responding to updates without using much battery power. But smart watches that are now starting to appear on the market can do the same thing. According to Kozlov, Yota Devices is not the only company that is trying to stand out on the tablet market. For example, Lenovo has presented a tablet with a projector. The user can project an image on the display onto any surface. "These gadgets have not created any particular sensation,” Kozlov says. “They will remain niche products, ones that just demonstrate the capacities of modern technology."